Recently, bridged nucleic acids have come to be more utilized as one of the promising components of therapeutic oligonucleotides. Oligonucleotides containing 2′-O,4′-C-ethylene-bridged nucleic acid (ENA) have been synthesized as functional oligonucleotides to further optimize the 2′-O,4′-C-methylene-linkage of bridged nucleic acids (2′,4′-BNA) or locked nucleic acids (LNA). Oligonucleotides containing ENA residues show three notable properties: (i) a high affinity to complementary single-stranded RNA to form duplexes, (ii) a triplex formation with double-stranded DNA, and (iii) a dramatically high resistance compared to 2′,4′-BNA/LNA against exonucleases and endonucleases. 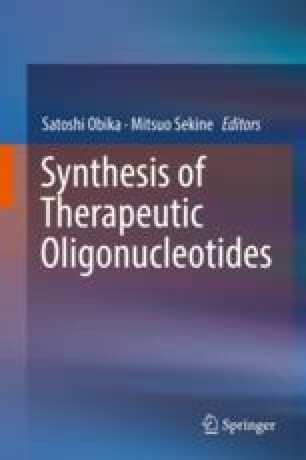 On the basis of these properties, ENA-modified oligonucleotides are currently being developed as therapeutics of genetic disorders such as Duchenne muscular dystrophy (DMD). On the other hand, a modified nucleotide containing 3′-O,4′-C-propylene linkage can be incorporated into the third position of 2′,5′-oligoadenylate (2-5A) to maintain biological activities with nuclease resistance. This modified 2-5A with 3′-O,4′-C-propylene adenosine could be useful for novel anti-cancer and anti-viral reagents as an RNase L activator.